Backroad Bob's Isle of Man TT Races, England & Ireland – These first ten published magazine articles are about the greatest motorcycle racing event on the planet – the two-week long festival of speed known as the Isle of Man TT Races. You may have heard about the Isle of Man TT Races and you may know it's special, but what you don't know is that it won't last forever. Forces bigger than motorcycling are threatening this two-week festival of speed. The 150-mph run down bumpy and crowned Bray Hill, three feet in the air at Ballaugh Bridge, and flat out at nearly 200 mph through the mist and over the “damp bits” on Snafell Mountain are sights you can't see anywhere else in the world and they're all on the endangered list. Add the stunt rider shows, the drags, the Ramsey bike show, Mad Sunday, the crazy crowds, and the nightly smoky burn outs on Douglas' Queen's Promenade and you've got something that's not to be missed. If you want to know how to get there, where to stay when you get there, and what to see when you get there, then you'll want to have this CD before you get there. There's also a look at the lesser-known Isle of Man Steam Packet Races. The last two articles will take you on a visit to Britain's National Motorcycle Museum where the 500 motorcycles on display will reveal how far back into the nineteenth century motorcycling's roots extend and then transport you to the land of Guinness, Gaelic, and Green where the world's fastest growing economy is making motorcycling affordable to the vibrant Irish people in an ancient land of hardship, suffering, and winding, narrow, cliff top roads overlooking the Irish Sea. The amount of “real” road racing in Ireland rivals that on the Isle of Man, but just like the non-TT Isle of Man races, they don't receive the coverage or have the fame of the TT. Don't overlook these less-publicized events or you'll be missing out on the best club racers in the world risking their lives in the best club races in the world. 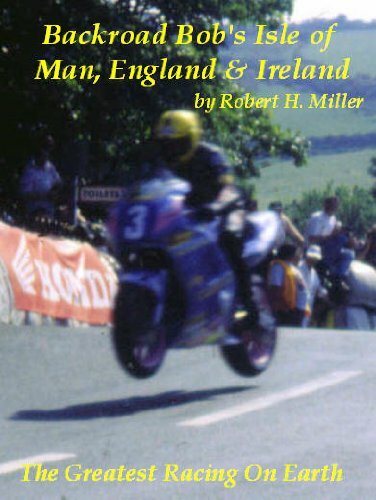 This Backroad Bob’s Isle of Man, England & Ireland ebook is one part of a 22-part CD series that is Backroad Bob’s Motorcycle Road Trips and includes the following titles. The CDs and the ebooks contain the same published magazine articles, but the ebooks are text-only and the dual sporting ebooks exclude the roll charts, GPS maps, and GPS coordinates. Qualifications – Twenty years as a published motorsports author. Thirty-seven years and over 250,000 miles as a licensed motorcycle operator. Thirty-five years and 185,000 accident-free road miles. Seventeen years and 43,000 miles dual sport riding. Ten years of East Coast Enduro Association competition. Forty years off-pavement riding. Completion of Motorcycle Safety Foundation Beginner and Advanced Rider Courses and Keith Code's Superbike School. A.A.S. – Mechanical Engineering with over 25 years professional mechanical experience.